Kiwi-Klenz provides an easy and effective way to help improve your digestive health. Made from 100% natural New Zealand kiwifruit, this convenient supplement is packed with enzymes, soluble fiber and prebiotics to support good gut flora and promote healthy digestive function. Kiwi-Klenz is an all-natural digestive supplement. It’s made purely of 100% premium green New Zealand kiwifruit, harvested in prime condition. A powerful pre-biotic with enzymes, Kiwi-Klenz which provides you the goodness of the whole fruit (pulp, seeds and skin) for optimum digestive health support. Kiwifruit skin is loaded with bioactive compounds and its inclusion results in a highly effective extract. Active ingredients are extracted using only pure water – no damaging heat or nasty chemicals are involved – to bring you a completely natural product of maximum potency. Good health starts with good digestion. Even if you follow an optimal diet, our nutrition is only as good as what we actually absorb. To properly utilize the food we eat, we need healthy gut flora and an efficient digestive system. Unfortunately, today’s lifestyle of processed foods, toxins, stress and pharmaceutical drugs can upset the delicate balance in our gut, leading to poor digestion and compromising our overall health. Taking one easy dose of Kiwi-Klenz every day helps to recalibrate your digestive system, contributing to improved wellbeing, increased energy and a greater zest for life. With these four components working together you’re on your way to healthier bowels and better digestive health. And with your digestion functioning at its best you’ll tap into a range of added health benefits too: improved skin appearance, more energy, better inflammation management and a stronger immune system. Servings per bottle: 60 (1 capsule). Daily Serving: Adults – 1-2 capsules per day. Children – 1 capsule per day. At 1 capsule, please take after a meal; at 2 capsules, take separately, after meals. Combines well with our Total Balance and Omega 3/DHA Fish Oil supplements for optimum digestive and general health. 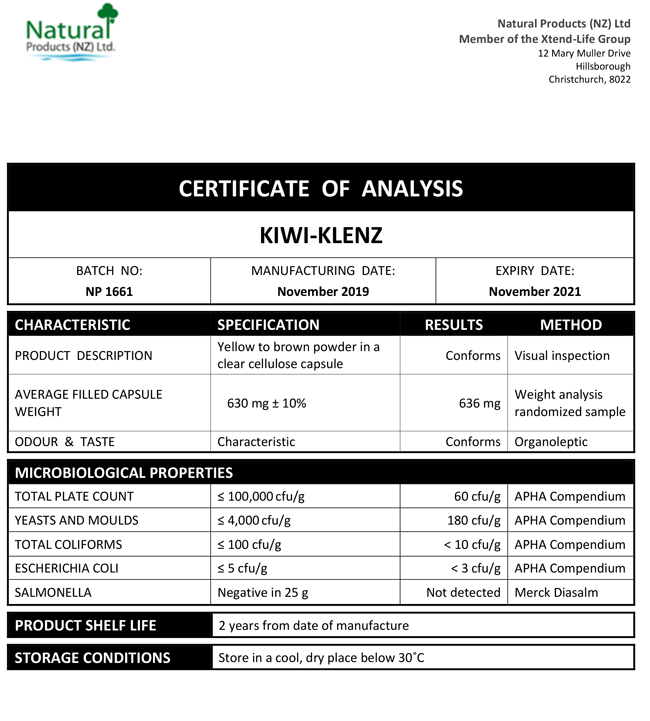 We have included below a copy of a typical Certificate of Analysis (CoA) for our Kiwi-Klenz. You will note that there are two columns which are headed 'Specification' and 'Results' respectively. The specifications are simply our minimum standard to which each batch of Xtend-Life Kiwi-Klenz has to conform, otherwise we would not release it. The results are the actual results from the independent laboratory that did the testing. If you would like any more information about our commitment to providing you with the highest quality products, please contact us. Can I eliminate my daily probiotic when I start taking Kiwi-Klenz? Yes, you can. Probiotics are useful at times – after a course of antibiotics, for example – but are best used on a short-term basis. There is not enough conclusive research about the regular and long-term use of probiotics. Kiwi-Klenz is not a probiotic, but rather it is a prebiotic that supports your digestive system to naturally produce its own good bacteria. It also contains phenolics which help to eliminate bad bacteria within your intestinal tract. Can I give Kiwi-Klenz to my child? 1-5 years old: Begin with a ½ capsule every second day for the first two weeks, then increase to ½ capsule daily if necessary. 6-12 years old: Begin with one capsule every second day for the first two weeks, then increase to one per day if necessary. It’s important to monitor the results and only increase the dose if your child is tolerating the product well. It’s also important to ensure your child has plenty of fluids when taking Kiwi-Klenz. If easier, you can open the capsule and add the contents to unheated food, such as a smoothie, juice or cereal. Can Kiwi-Klenz help with IBS? Kiwi-Klenz can help those affected by Irritable Bowel Syndrome (IBS). Kiwi-Klenz features soluble fiber, digestive enzymes and prebiotics to help feed the growth of good bacteria and limit the growth of bad bacteria. Regulating the digestive processes may be very useful in lessening the symptoms common to IBS such as bloating, indigestion, wind or constipation. Is Kiwi-Klenz useful for 'leaky gut syndrome'? Kiwi-Klenz certainly may be of benefit for leaky gut syndrome. Supporting healthy digestion means that the gastrointestinal system is able to focus on daily issues involving the integrity of the intestinal mucosal, to ensure healing and cell regeneration can occur. The enzymes in Kiwi-Klenz help to breakdown protein, which is why this product is designed to be taken after a main meal. By improving digestion, it may help to prevent large toxins and microbes from breaching the digestive tract so that they can be safely excreted from the body as intended. Can I take Kiwi-Klenz if I’m allergic to kiwifruit? No. We suggest that anyone with kiwifruit allergies should avoid Kiwi-Klenz, as this product is extracted from the flesh, seeds and skin of the fresh fruit. There may be other alternative options in our range to help support your digestion such as Total Balance and the Omega 3/DHA Fish Oil. Can Kiwi-Klenz be used as part of a detox plan? Kiwi-Klenz is not designed as a detoxification supplement. The body requires specific vitamins, minerals, amino acids and herbs to support detoxification. However, due to its high soluble fiber content, Kiwi-Klenz may be very helpful in removing built-up toxins or waste in the digestive system. Can I use Kiwi-Klenz to help cure my chronic digestive concerns? Kiwi-Klenz cannot be considered a 'cure' for chronic digestive conditions – but it may certainly be helpful. In order to treat a particularly troublesome or stubborn digestive concern the daily dose may be increased to 3 capsules per day, taking 1 capsule after each meal, with plenty of water. Is there any sugar in Kiwi-Klenz, since it’s made from fruit? Yes, Kiwi-Klenz does contain a small amount of natural sugar. One 500 mg capsule of Kiwi-Klenz contains approximately 185 mg of sugar, mostly in the form of fructose. This is a very low amount when compared to eating the fruit itself; one fresh kiwifruit contains about 9.5 g of sugar.